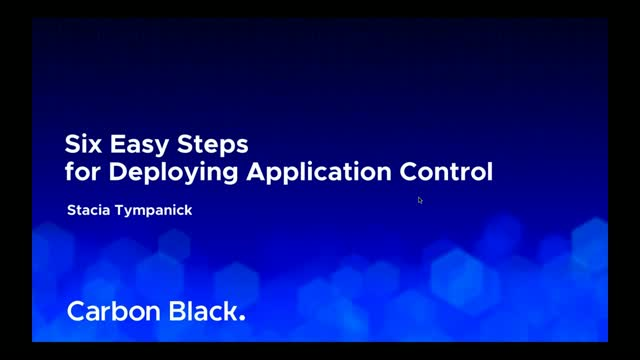 Join Stacia Tympanick, Field Solutions Engineer with Carbon Black, as she addresses key challenges experienced during the implementation of application control solutions, and shares six strategies and best practices for success. Threats such as WannaCry and Petya/NotPetya have demonstrated that hackers are more familiar with the vulnerabilities of your unsupported systems than you are. When new patches are released for new systems, attackers easily reverse engineer the update and quickly find all the weaknesses in your end-of-life (EOL) systems. Traditional security solutions are powerless in detecting and preventing advanced attacks and unknown threats. Join us as we examine the challenges posed to your EOL OS and share best practices for protecting your systems. - A better understanding of the challenges presented by your EOL OS. - Insights from other organizations that face your same challenges. - An action plan for how application control helps you meet (or overcome) these challenges. Are you struggling to keep your endpoint security up to date? You’re not alone. Small to mid-sized companies have less resources — yet have the same risk of attack as larger companies. And that risk is only increasing. In 2017, the number of ransomware attacks increased by 30x and the number of breaches increased by 40%. Good news! Smaller companies can protect themselves just as well as large enterprises thanks to cloud-based endpoint security. Join us for a live webinar to discuss how next-generation endpoint security in the cloud solved the most common challenges SMBs are facing. With the shift beyond malware, cyberattacks are becoming increasingly difficult to detect. Attackers are constantly learning, updating, and evolving, and it’s critical you stay ahead of them in order to keep your organization safe. More often than not, legacy antivirus just isn’t getting the job done. Join us for a live discussion with security experts from Carbon Black and eSentire, the largest pure-play Managed Detection and Response (MDR) provider that protects high-risk assets from advanced cyber threats, as eSentire shares the results of its recent Quarterly Threat Report, which provides a snapshot of the latest tactics cybercriminals are using. Real-time query and response solutions are revolutionizing cyber security by enabling Security and IT Operations teams to work together, speeding up analysis and response times and reducing risk in their organizations. While these SecOps products deliver a wide range of benefits, it can be difficult for your team to prioritize one set of functionality over another in this ever-evolving endpoint security landscape. During this live webinar, Michael Osterman, President at Osterman Research, will provide his expert opinion on how to evaluate real-time, next-gen SecOps solutions so that you can find the right one for your organization. As the pioneer in the endpoint detection and response market, year after year Carbon Black has continued to innovate and deliver mission-critical incident response and threat hunting capabilities to advanced security operations teams worldwide. Join us for a look back at where we’ve been, what we’re doing, and what the future holds for Cb Response and our latest offering on to the Cb Predictive Security Cloud, Cb ThreatHunter. Carbon Black (NASDAQ: CBLK) is a leading provider of next-generation endpoint security serving more than 4,300 customers globally, including 35 of the Fortune 100. The company’s diverse customer base includes global leaders in internet search, social media, transportation, and hospitality, as well as leaders across finance, manufacturing, retail, and government. Carbon Black combines unfiltered data collection, predictive analytics, and cloud-based delivery to provide superior endpoint protection that puts defenders back in control.